Drug loaded carriers from degradable polymers, namely, injectable microparticles, injectable in situ forming implants, and preformed implants, are established in the clinic for parenteral controlled drug delivery. 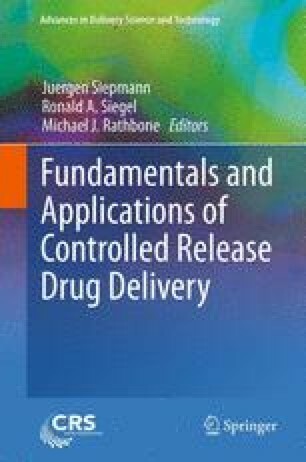 This chapter provides an overview on several factors influencing release behavior such as drug properties, effects of environmental conditions, osmotically mediated mechanisms, and the selection of the carrier type. Moreover, degradation and erosion of the polymeric matrices are discussed in detail in view of their impact on drug release for different relevant polymer classes and groups of bioactive molecules. Additionally, carrier type-specific issues are included based on the knowledge gained to date from available parenteral controlled release products, as obtained from a comprehensive review of the scientific and patent literature. In particular, preparation techniques and related mechanisms, and both advantages and challenges associated with degradable polymer based delivery systems are described. Strategies to establish a continuous drug release are examined based on rational evaluation of specific polymer classes and carrier types.